Amidst all the hubbub of RMEF’s inaugural 10-day Hunter & Outdoor Christmas Expo, presented by Cabela’s from December 3-12 in Las Vegas, a lot of good things have been happening to Rutting Ridge Cellars this week. Aside from sheer exposure, the Expo provided a springboard for our Cabernet Sauvignon, which was selected especially for the membership of the Rocky Mountain Elk Foundation and which is targeted to become a significant, ongoing fundraising program for the foundation. 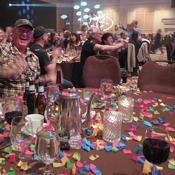 RMEF’s Volunteer Fun Night on Saturday evening was way more than cool. Various states and chapters were honored for their fundraising achievements—fundraising that now exceeds $1 billion for conservation projects since RMEF’s inception. That’s an increbile amount resulting from volunteer efforts! A word to the wise, take your ear plugs folks if you’re ever in attendance at one of these award banquets. Air horns and confetti filled the room. It was a sight to behold. And of course, the other sight to behold was the bottles of Rutting Ridge Cabernet sitting on all the winners’ tables, said wine being provided by Rutting Ridge Cellars. Combined with Wrangler NFR’s Cowboy Christmas, which is also being held in the south hall of the Las Vegas Convention Center, the icing on the cake is the National Finals Rodeo going on at the same time in the evenings over at the Thomas & Mack Center. 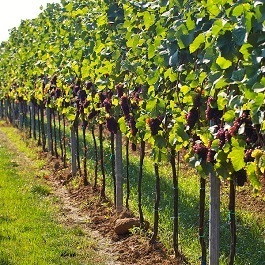 It’s been a week of firsts, and Rutting Ridge Cellars is happy to be counted among them!